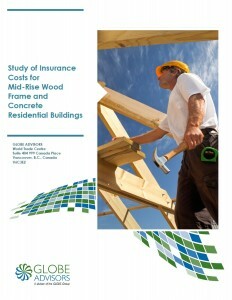 On behalf of the Concrete Council of Canada, GLOBE Advisors carried out an analysis of the costs to insure mid-rise (six-storey) wood frame residential buildings, with particular emphasis on the risk factors contributing to differentials between insurance rates for such buildings compared to structures built using various non-combustible materials such as cast-in-place concrete, insulated concrete forms, precast concrete, or concrete blocks. The genesis of this research stems from the growing presence of mid-rise residential structures built largely from wood frame or engineered wood products in various jurisdictions across Canada in the wake of changes and expected future changes in federal and provincial building codes. The analysis supporting this report was not intended to compare the relative merits of wood frame versus concrete buildings with respect to structural integrity, engineering design, energy or environmental merits or architectural aesthetics. Those matters are well documented in myriad studies and analyses readily available elsewhere, some of which are listed in the bibliography of this report. Rather, the focus is on assessing the factors guiding rate setting for insuring the construction and on-going operation of mid-rise residential structures and to determine the reasons for the significant differences that exist with respect to the availability of insurance and the rates charged for buildings constructed mainly from wood compared to those comprised of non-combustible concrete materials. In preparing this report GLOBE Advisors consulted with insurance brokers, underwriters, casualty and claims administrators, experts in wood frame and concrete construction, housing market developers, strata managers, and real estate agents. Full details on the methodology surrounding the preparation of this report are available in the document which can be viewed or downloaded at the link below.